Mon. June 29, 2015–The Belize Sailing Association (BzSA) is a fledgling NGO born a mere 5 years ago. The majority of its members do not themselves know how to sail. A handful or two are self-taught sailors, and fewer members than that were professionally trained and have extensive sailing and racing experience under their belts. The non-sailors rally support, because, like the experienced sailors, they have witnessed first hand how sailing leads to a child’s joy and to early development of essential life-skills including critical thinking, self-esteem and confidence, the ability to focus and concentrate, and social skills. In 2010, when BzSA became a formal entity, there were no Optimist dinghies at all in the entire country. Shortly after landing its first Optimist dinghies, IODA informed BzSA that it had subsidy funds for emerging nations to assist them in participating in regattas such as OPTINAM. Once BzSA had 65 Opties spread among Belize’s 7 sailing clubs and had run some years of its own formal competitive regattas, including National Championships, BzSA and its top sailors looked forward to venturing into international IODA regattas. Still, visiting professional sailing coaches and sailors with years of regatta experience note that Belize differs dramatically from other countries in that none of its 7 clubs is affiliated with and financially supported by a commercial yacht club. And hardly any of the Opties are privately owned; BzSA itself owns all but a few. Still, in 2014, confidence increased after all of Belize’s Optimist sailors finished in the top 8% among the 1179 Optimists in the historic 1st Annual Bart’s Bash. Now, thanks to IODA’s generosity, 4 of Belize’s top Optimist skippers – 2 boys and 2 girls – are entered in this year’s OPTINAM. It is an historic debut for Belize. 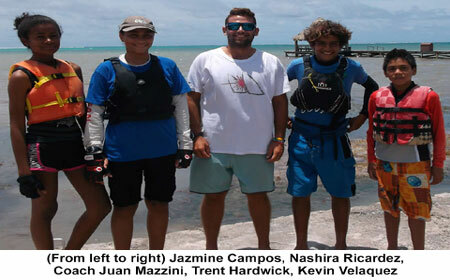 Kevin Velasquez: Kevin Velasquez is a 13-year-old native of Belize’s popular Ambergris Caye. He has been sailing since he was 9, and won the Belize Optimist National Championship in 2012. Kevin is generally quiet, but he has a droll sense of humor and does enjoy roughhousing now and again. His favorite subject in school is math. Aside from sailing, his favorite activity is futbol. His siblings say he is fiercely competitive; his coaches note he is gracious after both wins and losses, and eager to learn from his mistakes. On the water and off, Kevin is pretty consistent. When he won the National Championship, Kevin said his favorite thing about sailing was traveling and meeting new people. He says the same thing today. Trent Hardwick: Trent lives for sport and dreams of great achievements in sailing. He was born on 28th November, 2002, and spent the next 10 years of his life growing up in Belize City. As a baby he loved wáter, which seemed to calm him. At the age of 8, he joined the Belize Sea Scouts and began to learn the basics of sailing on a 2-man Bosun Dinghy. He quickly transitioned to the Optimist, and in early 2012 he took part in his first regatta. In 2013 he was National Champion and placed 3rd in 2014. He has participated in all Belizean regattas in this period, and travelled to Puerto Aventura, Mexico, in 2014 to participate in the Copa Maya. He is in his final year at Belize Elementary School where he has been in the volleyball team, the football team and is to be found in his after-hours playing basketball or table tennis. Trent’s favorite subjects are Science and Math. Jazmine Campos: Jazmine is 13 years old. She lives in Corozal with her mother and father, her 2 sisters, and her 2 brothers. She is in the 1st form at Corozal Community College and is ambitious to go on to university and become a pediatrician. She feels pride in being Belizean and says her courage comes from the same source. Jazmine says, I will strive to accomplish what I want in life. I love to be involved in sports. I love sailing most of all. I have been sailing for 2 years and 8 months. The best part of it is that I get to know new people and go to places outside my village. Recently I was chosen to represent my wonderful country, Belize, in an international regatta (OPTINAM) in Antigua. We will go there for 10 days. I am a very lucky girl, because not everyone had a chance to do something like this. Most of all, I want to thank Mr. Gerard Cordts, my sailing instructor. If it were not for him, I would not be one of the four who will represent Belize for the first time ever in a major IODA regatta. Nashira Ricardez: Nashira is 13, lives in Belize City, and attends Belize High School, where her favorite subject is science. Friends and family admire her quiet self-confidence and grace. Nashira comes from a family of avid sailors, and has been sailing since she was 9. When not in an Optie, she can handle and enjoy the family’s Laser. Like others from Belize, one of the things Nashira enjoys about sailing is seeing new places and meeting new people. They are coached by Juan Ignacio Mazzini, 25, from Argentina. Juan was Argentina’s 2003 Optimist National Champion before graduating to Lasers and subsequently to training younger Argentinians who competed with excellence in ISAF Laser Youth World Champion regattas.